When I met Rachana and Maximilian for the first time in December 2017, I knew their wedding was just the kind of wedding I wanted to do. Rachana and Max, both investment bankers, were brought up in Australia and had then moved to London. It was our first cross culture wedding at CRE and we always knew this would be special. Rachana and Max are both extremely simple with an amazing clarity of thought. They gave us all the freedom in terms of decor but both were very clear that the wedding has to be intimate and personal. It all began with the venue they chose: Aashyana Lakhanpal. It is a villa property in Candolim, Goa. The first thing that will strike you once you visit Aashyana is Nature and Calmness. The Mehendi was supposed to be a pop of colours in the porch of the main villa. Rachana wanted everyone to feel like they’ve entered her family home. We added a lot of photo frames with family pictures of the couple to give it a homely vibe. We brought some Charpais, centrepieces, drapes on the pillars and board games in the courtyard to make everyone feel like they were in the home of the bride. The second day was a beautiful South Indian weddings ceremony. 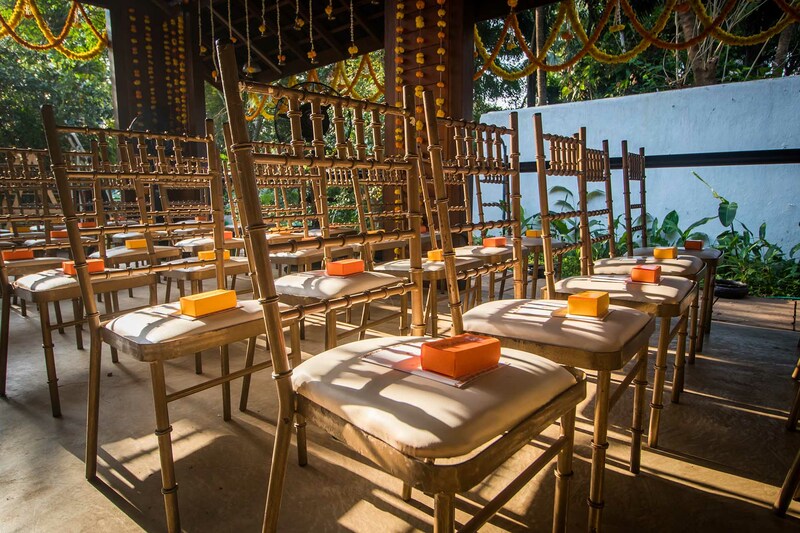 She threw us a challenge when she asked us to transform the Yoga Pavilion into her wedding venue. We had to accommodate all the guests, setup the Mandap and organise the traditional South Indian food service in the pavilion. We followed a white and yellow theme and used only Indian flowers to keep the look extremely traditional. Rachana and Max wanted their poolside reception to be extremely intimate and warm. Rachana was very certain from the beginning that she wanted a sit down dinner. There was a tree in the middle of the venue and though she was most worried about this, we at #teamCRE were most excited about it. We used the pool, trees and bulbs to accentuate the natural beauty of the venue. What translated was one of my favourite setups by CRE. It was simple, detail oriented and extremely elegant. Just like the beautiful couple!